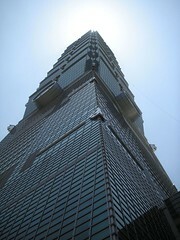 Went to the Taipei 101 building today - the world's tallest building. And one of the coolest looking buildings I've seen. The observation deck is on the 89th floor, and the elevators get you there at an amazing 1000 Meters per Minute. It was an incredible experience. Photos of our day, and from the top of the building on my Flickr site. 1000 meters per minute? Wow. That's one building where I won't be able to take the stairs and get there faster -- assuming of course that somebody didn't think it was "funny" to push all the buttons. The only tall building I've ever done the tourist thing in is the John Hancock in Chicago. Back when I did it (in the 70s sometime) the tour guide was bragging about how they were the fastest elevators in the world -- the ride to the top was 93 seconds. But yours are very roughly twice that fast. How much longer will you be visiting there? I'll be here until Friday. My flight leaves at 11:55pm, so I have another 3 days to go (it's Wednesday morning as I write this). Lots of work to do in those few days, so I won't be bored. :) We've been told we are being taken to one of Taiwan's famous Night Markets tonight or tomorrow, so I'm looking forward to that.